The 45-acre Preserve is open free of charge to the public from dawn to dusk. Help us protect what you have come to enjoy. Natural areas are delicate; foot traffic only, no camping, fires, or motorized vehicles. Please respect boundary signs. No hunting due to proximity of homes. Dogs permitted on leash. Please pick up after your pet and remove all waste from the preserve. The property is on the deep water shore of Winnegance Bay at Green Point. The wooded upland is primarily spruce-pine, with hardwood dominated sections on the southern point. A ridge runs north-south along the center of the property and drops off sharply to the east and west. 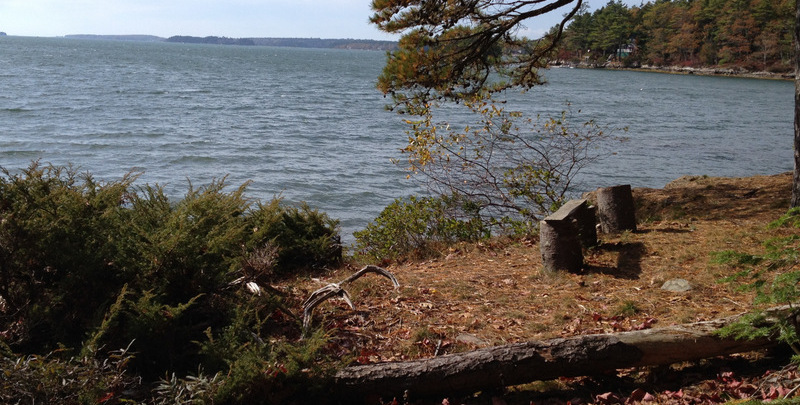 There are lovely rocky outcrops and views of Winnegance Bay, down the New Meadows River toward Cundy’s Harbor in Harpswell. Access to the preserve is by deeded right of way from Birch Point Road along an old woods road. To the west of the trail is a small stream that drains the trailside wetland into Brigham’s Cove in Winnegance Bay. Vernal Pools are present, providing essential breeding ground for fairy shrimp, wood frogs and salamanders. At the head of Brigham’s Cove is the old “Indian Carry Road” where the Native Americans carried their boats across a narrow strip of land to reach Winnegance Creek, and the mighty Kennebec River at Doubling Point. A current resident of Brigham’s Cove remembers seeing Native women come into Brigham’s Cove to collect grasses for basket making. Insects and plant material are the main sources of food for the downy woodpecker. Deciduous forests are their native habitats and they take 1-3 weeks to build nests in dead trees or dead parts of live trees. The soft wood makes excavating easier. The wild turkey is one of only two domesticated birds originating in the New World. They reside in hardwood forests and feed on acorns, nuts, seeds and salamanders; nesting in a depression of leaves on the ground. The red squirrel feeds on insects, seeds and pine cones. They are most active in the early morning and late afternoon and especially enjoy drinking sap from maple trees. White Tailed Deer are tan in the summer and a gray-brown in the winter. They are herbivores and are able to run up to 30 miles an hour. Fawns are reddish at birth (May) with white spots. Goldthread is found at the preserve. This dainty evergreen plant of the buttercup family has bright gold threadlike roots. Native Americans had a ready supply of fresh goldthread available throughout the year for either chewing or making a tea. This strong bitter has been used for a variety of digestive disorders, worms, jaundice, and as a so-called blood purifier. This carving in the rock at the point is a mystery. What do you think it means? The Abenaki Indians lived, hunted, fished and stewarded this region for many years before white settlement. 1881 - Julia, Mary, and Ellen Woodward sell land to John and Emma Campbell for $110. The Woodwards were a farming family and lived in Brunswick. 1958 - Florence Campbell, daughter of John and Emma, sells the land to Olive Boyd Guild. 1960s - After lengthy negotiation, Florence’s sister sells her portion of land to Olive Guild, doubling the property size. 1974 - Eastham Guild inherits the land from his mother, Olive B. Guild. Eastham was married to Mary Newall, whose father was the head of BIW from 1928-1950. 1985 - Mr. Guild receives an assignable right of way from Birch Point Road to the property from his dear family friend, John G. Morse, Jr.
December 4, 2004 - Eastham Guild, Jr. grants the property to the Land Trust. Mr. Guild used his property as a place to keep in touch with nature. It was his desire to keep the land undeveloped for the locals to enjoy. August 3, 2009 - Opening ceremonies are held at the preserve with neighbors and the Guild family. Follow Rt. 209 from Bath 2.4 miles to the Winnegance Store; take a right on High Street, which eventually becomes Campbell Pond Road. 2.2 miles from the store take a right onto Birch Point. Parking is in the small gravel lot 1 mile down on the left. View Map. Share what you see at Green Point!